IO Ports 2x USB 3.0, 1x VGA, 3x LAN, 1x PS/2 KB/Mouse Ports. 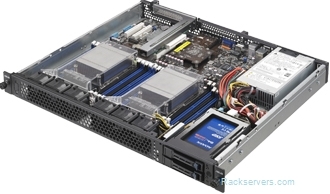 Description 1U Asus RS400-E8-PS2, short depth 383mm, 2x 2.5" Hot Swap HD/SSD Bays. 500W 80plus Platinum PSU.